Overlooked melodrama about a lumber tycoon who marries to further his career and abandons the woman he truly loves. Credible production is perhaps more fascinating for its behind-the-scenes shenanigans. Howard Hawks was fired by producer Samuel Goldwyn after directing the first half, and subsequently hired William Wyler to complete the film. This is reflected in the shifting storyline. Starts out as virile logging adventure then fades into an over plotted soap opera, all the while distinguished by solid performances. 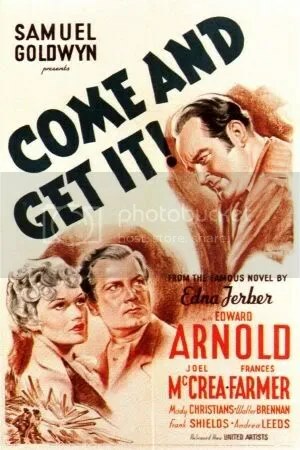 Character actor Edward Arnold stars as Barney Glasgow, the businessman determined to succeed. As both mother and daughter, troubled actress Frances Farmer is also worth watching in one of her rare film performances. Interestingly it was Walter Brennan who won the Oscar for Best Supporting Actor for his likable but unremarkable work as Glasgow’s lifelong friend. Sweeping drama is also notable for the extraordinary logging sequences in the first half. Classic MGM spectacle is highlighted by remarkable re-enactment of the 1906 San Francisco earthquake. What’s more, this romantic drama includes an engaging story as well. Young, classically-trained singer is plucked from obscurity and becomes a success. Complications arise when she is also offered a chance to sing with the Opera, in decidedly classier surroundings. 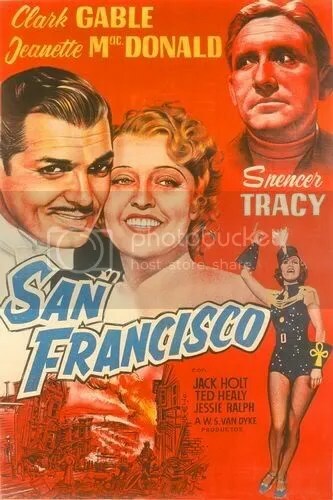 Grand, but dated period film was a huge blockbuster in its day and it’s easy to see why. Nominated for six Academy Awards including Best Picture.